I was only introduced to Gatineau towards the end of 2016 and I was so impressed, I stocked up on a few products. When I was asked to take part in the allbeauty Gatineau Challenge, I jumped at the chance. 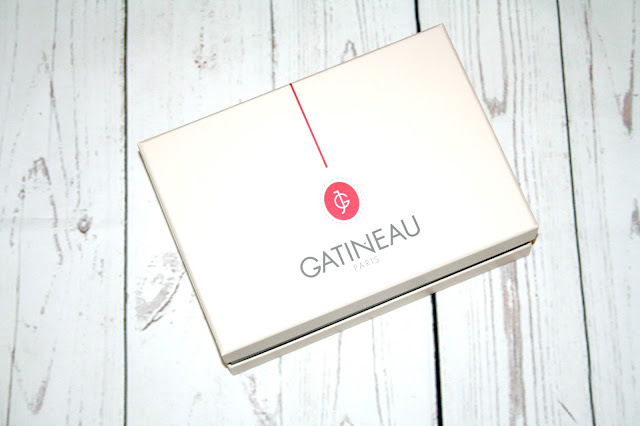 Presented in a beautiful Gatineau Box are five skincare products and a cleansing cloth which gives me a Monday to Friday go-to beauty regime. My challenge is to use the five products within the box, which have been put together by the allbeauty resident facial experts to see how my skin feels after five days. A Double-Sided Cleansing Cloth in a bag - This is one of the softest cloths I have ever used and I am really looking forward to using it. Gentle Eye Make-up Remover 50ml - This product uses extracts of cucumber, green tea & aloe vera and is not only lightweight on the skin but it is described as being wonderfully cooling and refreshing as it gently removes the remnants of the day as well as all traces of waterproof eye makeup. Melatogenine Refreshing Cleansing Cream 50ml - This is a triple-action formula refreshing cleansing cream which is an anti-ageing cleanser, toner and micro-exfoliator in one. This soap-free solution removes all traces of make-up. The youth activating molecule, Mélatogénine, encourages cellular renewal. With a rich and velvety texture, this cleanser nourishes the skin with added anti-oxidants and sweet almond oil to leave your skin feeling clean and refreshed and with fine lines and wrinkles are visibly reduced. Melatogenine Future Plus Mask 15ml - Described as being a powerful anti-ageing mask designed to smooth fine lines and wrinkles, reduce the signs of fatigue and leave skin youthfully radiant. It is luxuriously rich and creamy packed with Marine Collagen and Hyaluronic Acid to instantly transform the skin. Melatogenine AOX Advanced Rejuvenating Cream 15ml - Gatineau describe this product as being their most powerful anti-wrinkle formula within a luxuriously rich cream and it is designed to smooth fine lines and wrinkles brighten the complexion and eliminate signs of fatigue. I have used some of these products before but not as a 5-day challenge, so I am really looking forward to seeing how my skin changes and whether or not it improves for the better. If you like the sound of these products and want to set yourself a challenge, you can find the box of products right HERE on allbeauty and it costs just £19.95. This sounds like a challenge I want to be part of! Ooh now these are a brand I'd love to try! The only Gatineau product I've ever tried is the Radiance Enhancing Gommage. It was okay but maybe a little over hyped. This is a great box as I really want to try more products from this brand. I've not tried anything from Gatineau, but I'd love to know how you get on with the eye makeup remover because I'm always looking for new ones to fall in love with. The future plus mask sounds like it could be amazing. I've not heard of this brand before, such a deal you got though! That's a great way to try out a few products from the brand! I've never tried anything from this brand before but I'm really intrigued now! I haven't tried anything from this brand before, I can't wait to see your thoughts after five days.